This blog is dedicated to sharing what God has done, and is doing, in our lives. We desire our lives to be a place where we grow to be more like God: full of love, joy, peace, patience, kindness, goodness, faithfulness, gentleness and self-control. This is not a one time, red letter day on the calendar. No, this is a process. This is a journey we are on with Jesus. One place we were looking forward to taking Wendy for both ministry and beauty aspects was Maligcong. The views are breathtaking and the terraces cut into the mountainsides are a marvel to behold. Our plan was to arrive early Saturday and hike through the fields to the sitio (neighborhood) of Fang-orao. There we would visit and pray with people until evening when a special service would be held. A view of the Maligcong rice terraces from the jeepney turn-around point. The hike to Fang-orao is about 30 minutes or so on the narrow pathway through the fields. The views along the way are beautiful, especially on clear days. Unfortunately, while attending the ordination of a Bontoc pastor, we found out that we would not be able to take this path during the weekend due to a pagan holy day called "T-er". The village elders declared this holy day in preparation of the impending rice harvest. As part of the ceremony, a few men gather a cup of rice and hike through the fields and over the mountain into Bontoc with the intention of symbolically leading the rats and birds away from the village in a manner similar to the pied piper of Hamlin. Following this ceremony, nobody is allowed to pass near the fields for 3 days. The people of Fang-orao and Favarey which is another 30 minutes hike beyond are cut off during this time. During discussion with Pastor Augustin who was helping to coordinate our visit and pastors the church in Fabuyan, at the jeepney turn-around, another pathway was mentioned. It is a difficult and rarely used trail that goes around the fields by going down one mountain and up the other into Fang-orao. Not being sure that everyone in our group could handle the hike or the return hike in the dark, it was decided that Alexie and I would go on Saturday and the rest would take the early jeep Sunday morning to join us for the service in Fabuyan. Once Alexie and I arrived however, we were told that the other pathway came near a rice field also so nobody could walk that way either. Pastor Frederick who pastors the church in Fang-orao took us to talk with one of the village elders, Edward, to see if we could work something out. We met with Edward at his daughter's home and over coffee discussed our desire to find a way to go to Fang-orao. Most of the discussion was in the Igorot dialect between Edward, Pastor, and Edward's son-in-law. But I did get to talk a little with Edward about his role as a messenger for the US troops during WWII. The end of the discussion was that he would talk with the chief elder about our dilemma when the other returned from checking on his animals in the mountain. For the meantime, we could plan on using the path through the terraces on Sunday afternoon to go as far as Fang-orao, but no further. During the service there were a number of young men from Favarey, the farthest sitio. They had taken the jeepney from Bontoc only to find that they could not proceed to their homes. Since they had nothing else to do, they showed up for the service even though they are not believers. Maybe God had a plan amidst the frustrations of the t-er after all. Alexie during her dance to "Above All"
In the morning, even before the 1st jeep had arrived from Bontoc with Wendy, Lisa, and the girls, we were told that we would not be able to pass by either pathway to Fang-orao. So we continued with the service planned at Fabuyan with Pastor Augustin's congregation. Alexie performed another dance to The Power Of Your Love. Wendy shared some songs using sign language. 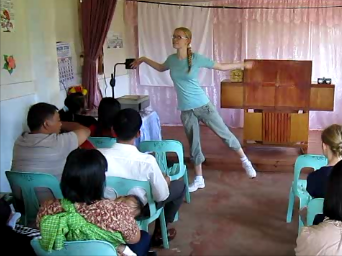 Alexie dancing to "The Power of Your Love"
The 4A's presenting Sunday School to the children in the newly finished classroom. Best of all Wendy was able to present the pastors of both communities, Fabuyan and Fang-orao, with Proclaimers. The pictures below were taken while the congregation listened to the story of the crucifixion and resurrection in the Ilocano language. This dear lady shared great insights and had thoughtful questions in our discussion after listening. Having heard that we held our health clinic for the people of Can-eo, Pastor Augustin asked if we would do the same in Maligcong. It went well, but because of the t-er, only the people of Fabuyan could attend. While Lisa and I squeezed arms and poked fingers, Wendy made friends with the ladies who were there. At the same time, our girls had fun with babies and balloons. They twisted animal balloons for the children nearby and passed the babies from one to another. The little guy in the picture below seems to have figured out how to turn a balloon animal into a wind instrument. Now he is giving lessons to a friend. And he's back to playing a solo. Sunday morning at Can-eo Station Church began with Adriana, Alexie, Alayna, and Annalise leading children's church. Again they used the translations of the Read Aloud Bible Stories. Most of the time they used the recordings we have made of a native speaker reading the story. Sometimes though, the girls read the translation themselves. Alexie reading "Ti Bassi-Bassit Nga Tao" or "The Man Who Was Too Little". After reading the story, the girls led the children in a song and taught them the motions that go along with the song. At first there were only a few children who came. As time passed, more came. Some were too shy to enter and stood by the door. As we have seen everywhere else, even adults enjoy hearing the stories. Others that were too shy to come in stood at the windows. After going through the stories once, the girls invited others to hold the book as the stories were played. This helped other children to be less shy. Wendy again signed a song for the congregation. This time though, a couple of the ladies who worked so hard to learn the signs last night joined her in the presentation. And again, our girls found babies to hold and to love on. With Pastor Rudy's translation I presented an overview of the Bible then we listened to Matthew 27 & 28 using the Proclaimer. The Proclaimers have been very helpful in both Can-eo and Chapyosen as people gather to study God's Word. After service, we held our health clinic, testing blood pressure and blood sugar for all who were interested. As we squeezed arms and poked fingers, Wendy gave lessons in sign language, and the girls twisted animal balloons for the children. We spent last weekend in Can-eo and Chapyosen. First we had to take a jeepney to Can-eo. It is about an hour through the mountains. Lisa took some time to talk with Rosita, a teacher and mother in Can-eo. Rosita was busy separating camote greens. When Lisa asked Rosita to show her how to help, Rosita was concerned that Lisa would get her hands dirty. As you can see, Lisa was able to convince her that it was okay to get her white hands dirty. Lisa and Rosita chatting and chopping. Wendy and my lovely ladies on the way to Chapyosen. Crossing the hanging bridge to enter the sitio of Chapyosen. When we finally made it to Chapyosen, we were hot, tired, and surrounded - by children. The kids especially liked it when Wendy photographed them then reviewed the photos on her camera. In this place without electricity and isolated by mountains, they don't see many foreigners or photos of themselves, so she garnered a lot of attention. Adriana, Alexie, and Alayna all enjoyed holding the little ones of the village. Espirita, one of the believers in the village, invited us to have lunch at her house. 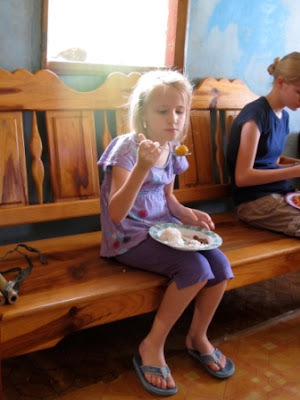 We shared our peanut butter sandwiches and she shared her rice and potatoes. While we took a break, we set the Proclaimer in the sun to charge. Espirita's sons sneaked over to investigate. Investigating the Proclaimer through the curious eyes of a pair of boys. Above our heads as we ate, we noticed this spear. I understand that most spears and shields have been sold to antique collectors over the years. It is the first time I saw one outside of a store or museum. When we returned to the house where the church meets, the girls played the Read Aloud Bible Stories for the people as they gathered. 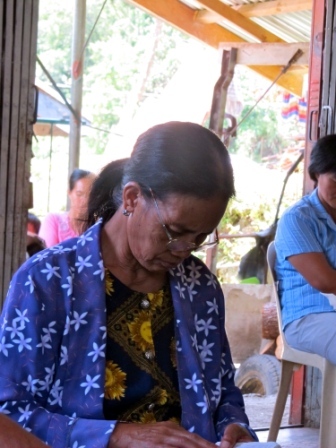 People of all ages listened intently as the Ilocano translations of the stories were read. When we were preparing for the trip and talking with Pastor Rudy, pastor of the Can-eo Station Church and fellow YWAMer, we found that several of the mothers in Chapyosen had expressed a desire to have a Bible. So before going, we obtained Ilocano translations. Before beginning our Bible study, Lisa wrote their names in the Bibles and presented them with their own Bible. The first passages they asked about were the stories they had just been listening to. It was exciting to see them intently follow along in their own Bibles when we listened to the Proclaimer later in the teaching. 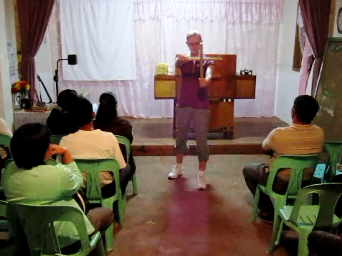 With Pastor Rudy's translation, I taught an overview of the Bible. Afterward, Pastor Rudy talked about how helpful this type of teaching is for this group of people. Thomas and Pastor Rudy teaching an overview of the Bible. The roof was too low to stand up all the way. We made it back to Can-eo in time to make supper and lead the evening Bible study at the church. Wendy presented We are Going to See the King using sign language. The congregation requested her to teach them the motions. After service was over, many stayed to have Wendy work with them until they could do the signs on their own. In our preparations for the weekend, Pastor Rudy did not tell us about the Bible study. But Saturday he asked who would be teaching. Lisa volunteered and taught from Colossians. Some of those attending Saturday night Bible study. It was a full day and when everything was over, I believe everyone slept well. The establishment of the PHILEO Response Team here in the Philippines. 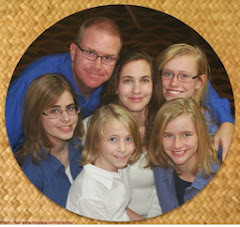 Our recent experiences to help tranform us into the likeness of Christ. People who will partner with us in prayer and finances.